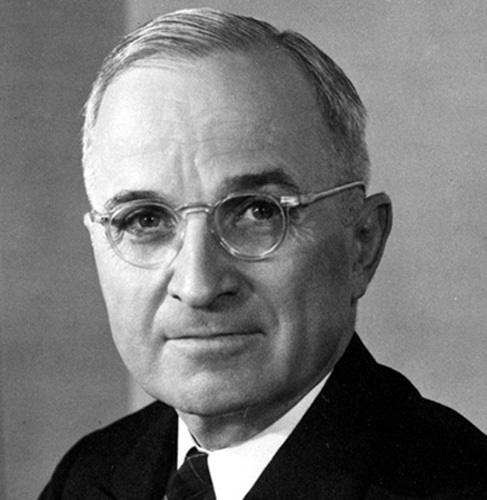 President Truman famously kept a sign on his desk that said “The buck stops here”, a gift from an avid poker player. Yet whilst we might appreciate the imagery and the sentiment, should we really rely on there being a ‘buck‘ to pass? Is there always a man in charge, someone with whom the ultimate responsibility lies? The public at large like to believe so. Having someone who is nominally in charge provides a feeling that there is some level of control over daily events, that there is some direction to the madness that seems to govern our lives. It isn’t particularly important whether that person you believe in is God, the president, the Führer or Chuck Norris. Nor does that responsible person need to be an individual, it can just as easily be taken as being particular position, a group of people, or an organisation. Yet having someone to look to as the ‘Man in Charge’ also entails having someone to blame when things go wrong. In general, people are not willing to look at events as the result of complex systems of uncountable interconnected threads. Such systems lack palpability, they invoke confusion and lack obvious conclusions. Much easier to view events as the result of simple inputs and outputs, revolving around the decision-making roles of important personages. When the proverbial hits the fan, the easiest response is to find those at the helm, whether particular individuals or a group, and lay the blame as thick and fast as the cement mixers can provide it. It’s a simple and effective reaction, since any person that can be held culpable must have made decisions, and any decision can be deemed retrospectively fallacious. Ergo any individual can be made and held responsible. 1We should not forget, of course, that as much as we enjoy seeing certain individuals as being responsible for the workings of the world, both for the comfort it gives us whilst things are ticking along smoothly, as well as the convenience of having someone to blame when they don’t, the individuals themselves also enjoy a level of revelry in the illusion that they are the ones with all the answers. Take a quick flick through the history books, and you can find countless examples of this kind of scapegoating. The individual in question need not be reprimanded or even blamed, but we can see how the complex events of history were pinned on the actions and decisions of this one great personage. Take the failed General Strike of 1926, which occurred because Prime Minister Stanley Baldwin went to bed early, for example. Or the Battle of Borodino, was lost because Napoleon had a cold that day. There are any number of examples strewn throughout the historical literature, which describe the passing of major events through the actions and ideas of great individuals. Such writing of history maybe frowned upon, but it makes for a simple and entertaining discussion. How often have you seen a history of Europe in which whole peoples are summed up in such remarks as “the Germans believed” or “Russia felt”? How often are the courses of nations described as if being the personal hobby of one or other historical personality? Or how many people would recognise the name Gavrilo Princip as belonging to the man who started the chain of events that apparently led to the First World War? Why do we all fall for the Man in Charge fallacy? We like to anthropomorphize a complex system of multiple power centers, bottom-up social norms, and spontaneous markets, innovators, and entrepreneurs, because it is scary to think of such a complex system with no Man in Charge. Perhaps fear is exactly what prevents us from acknowledging the complexity of such systems. Though a certain level of convenience must also be acceded. Opponents of the government can argue that in the face of an economic crisis, it is clear that they overspent in the preceding year(s). Others argue that they spent too little. Some that they interfered too much in the market, yet others that they were too lax. It is the greatest position for the opposition to be in, since every argument they use is right. For the government was responsible at the time, thus the government must have been in error, therefore the government made the wrong decisions, and in that experimental laboratory of history there are no control tests and no repeat conditions. Yet whilst the truth of what Easterly writes is fairly evident to see, for all who stop and think for more than a few seconds, the illusion of anthropological authority will always be with us. Set aside the angst ridden problems of an existentialism based on chaos and unrule, we need the chimera of the reprehensible individual as an idea we can understand and utilise. A complex system with more factors than we can conjure may be something to study in an ivory tower, but it isn’t something we can talk about, argue about, and shout about in the streets. Man is the centre of Man’s universe, and his self-deification continues to this very day. When Man created God, he had God conveniently recreate Man in his own image. Now that God has for many become optional, Man is left to fill the gap of responsibility. Despite the evidence of his exploits staring him in the face, Man continues to distance himself from the world around him. Extinctions almost always have his actions at root, global warming is a result of his ignorance or greed. Even the very products of his toil are labelled as man-made, counterpoint to all that is natural in the world. We take responsibility onto ourselves as a species – and then we play pass the buck. Responsibility is an interesting phenomenon, when we step and look at it a little more objectively. We deal in it as currency, taking it when it suits, gladly passing it on where it doesn’t, and when things go wrong, laying the finger of blame on anyone we happen to find carrying it. Finding the roots of this psychology would be a difficult quest, though an interesting one, and one that no doubt shows fundamental equivalents in other members of the animal kingdom. But I cannot in any event imagine a future in which responsibility will not play a part in everyday society, qualming angst before unpredictability, providing the illusion of control over the unaccountable, and affecting change through the apportioning of blame and the running of scapegoats. 1. ↑ We should not forget, of course, that as much as we enjoy seeing certain individuals as being responsible for the workings of the world, both for the comfort it gives us whilst things are ticking along smoothly, as well as the convenience of having someone to blame when they don’t, the individuals themselves also enjoy a level of revelry in the illusion that they are the ones with all the answers.